Andrew Walter Reid (born March 19, 1958) is an American football coach who is the current head coach for the Kansas City Chiefs of the National Football League (NFL). Reid was previously the head coach of the Philadelphia Eagles, a position he held from 1999 to 2012. From 2001 to 2012, he was also the Eagles' executive vice president of football operations, effectively making him the team's general manager. He led the Eagles to five National Football Conference (NFC) championship games, including four consecutive appearances from 2001-2004, and one Super Bowl in 2004. Reid was fired by Eagles owner Jeffrey Lurie following the 2012 season and reached an agreement to become the head coach of the Chiefs five days later. Reid played college football at Brigham Young University. Born in Los Angeles, California, Reid attended John Marshall High School and worked as a vendor at Dodger Stadium as a teenager. He also played youth sports in Los Angeles, and among his coaches was Pete Arbogast, who is the radio announcer for the USC football team, and formerly the radio play-by-play man for the Cincinnati Bengals. In 1971 (at age 13) Reid appeared live on Monday Night Football during the Punt, Pass, and Kick competition. Reid played offensive tackle at Brigham Young University from 1978 to 1980. Reid was hired as an assistant coach by the Green Bay Packers in 1992, the same year quarterback Brett Favre became a member of that team. Reid was named the Packers' quarterbacks coach in 1997, the season after the Packers won Super Bowl XXXI. During this time he worked under head coach Mike Holmgren. In 2001, Reid was named executive vice president of football operations of the Eagles, effectively making him the team's general manager. Although the Eagles have had someone with the title of general manager since 2005 (Tom Heckert from 2005 to 2010, Howie Roseman from 2010 until Reid's departure, Reid had the final say on football matters. The Eagles in 1998, then under coach Ray Rhodes, finished in a three-way tie for the NFL's worst record at 3-13, which gave the team the 2nd overall pick. 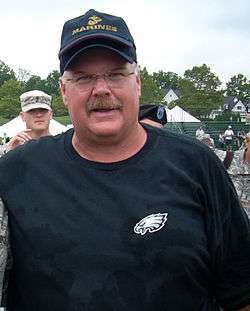 The Eagles hired Reid as their head coach in 1999. The team drafted dual-threat quarterback Donovan McNabb with the 2nd overall pick, although Reid started former Packers backup Doug Pederson for the first 9 games of the season. They improved two games in 1999 to finish at 5-11 (including the team's first road victory in 19 games, a 20-16 win in Chicago on October 17). In 2000 the Eagles posted an 11-5 regular-season record and won their first playoff game since the 1995 season, beating Tampa Bay in Philadelphia on New Year's Eve. In 2001, Reid's Eagles won the first of four consecutive National Football Conference's Eastern Division titles, the longest such streak in franchise history, and advanced to the conference championship game in 2001, 2002, 2003 and 2004, losing this game on the first three occasions. The 2003 team qualified for postseason play after opening the season with two losses, both at home, and was also the first NFL team ever to reach the conference title round of the playoffs after having been shut out at home on opening day. The 2004 team was the second NFC East squad to defeat all of its division rivals (New York Giants, Dallas Cowboys, and Washington Redskins) twice during the same regular season (Dallas Cowboys did it in 1998). The 2004 Eagles clinched the NFC 1st seed with a 13-1 record and proceeded to rest their starters for the final 2 games. After 3 straight NFC Championship losses, the team beat the Falcons 27-10 and made it to Super Bowl XXXIX but fell to the New England Patriots 24-21 in the final minutes. The 2005 season was difficult for Reid, as he was unprepared to deal with wide receiver Terrell Owens' flamboyant persona, which forced Reid to permanently deactivate him midway through the season. A couple of weeks later quarterback Donovan McNabb suffered a season-ending injury, leaving the Eagles without the services of two of their star players. The Eagles lost eight of their last ten games and finished 6-10. In the 2008 season Reid's 9-6-1 Eagles managed to knock off the defending Super Bowl Champions, the New York Giants, in the divisional game, leading the Eagles to a 5th NFC Championship game, where they lost to the Arizona Cardinals 32-25. He also coached the NFC to a 30-24 win in the 2009 Pro Bowl. However, the team was devastated by the loss of Jim Johnson, who had been the defensive coordinator for Reid's entire career and had helped turn the Eagles into one of the NFL's elite defenses. In the 2009 season Reid failed to win a first round post-season game for the first time in his career, with his 11-5 Eagles being eliminated by the 1st place Dallas Cowboys 34-14 in the wild-card round. Over the off season the Eagles traded longtime starting quarterback Donovan McNabb to the Redskins. 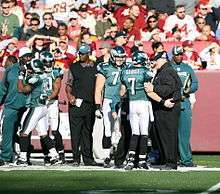 After week 2 of the 2010 season, Reid named Michael Vick the starting quarterback of the Eagles. During his 14-year tenure, Reid compiled the best win total (120), winning percentage (.609) and playoff victory total (10) in team history. He captured six division titles and five trips to the NFC Championship game. During this period, no other franchise earned more divisional playoff round appearances (7) and only Bill Belichick's New England Patriots exceeded Philadelphia's (5) conference championship game appearances with (6). Reid also sent 19 players to 44 Pro Bowl appearances, the highest total for any team in the NFL during that period. None of these players had ever appeared in a Pro Bowl before Reid was hired. Since 1990, only nine first-time head coaches remained with their original team for eight or more years: Reid (1999–2012), Tennessee’s Jeff Fisher (1994–2010), Brian Billick (1999–2007 with Baltimore), Bill Cowher (1992–2006 with Pittsburgh), Dennis Green (1992–2001 with Minnesota), Tom Coughlin (1995–2002 with Jacksonville), Jack Del Rio (2003–2011 with Jacksonville), Cincinnati's Marvin Lewis (2003–present), Green Bay's Mike McCarthy (2006–present), New Orleans' Sean Payton (2006-present), and Pittsburgh's Mike Tomlin (2007-present). On January 4, 2013, Reid reached a 5-year contract agreement to become the head coach of the Chiefs. On the same day, the Chiefs fired general manager Scott Pioli. Originally, Reid's contract made him the final authority in football matters, the same power he had in Philadelphia. A week later, however, the Chiefs hired John Dorsey, who had previously worked with Reid as an assistant in Green Bay, as general manager. Reid and Chiefs owner Clark Hunt announced that Dorsey will have the final say in personnel matters. On the same day, Hunt announced that Reid will report directly to him; in the past Chiefs coaches reported to the general manager. In Reid's first game as head coach, the Chiefs beat the Jacksonville Jaguars 28–2. It was the widest margin of victory for the Chiefs on opening day since they defeated the Denver Broncos in 1963 by a score of 59–7. In week 3, Reid returned Lincoln Financial Field in Philadelphia for a Thursday Night Football game between the Chiefs and his former team, the Philadelphia Eagles. As Reid walked out onto the field before the game started, the crowd gave him a standing ovation. The Chiefs went on to win 26-16 and Reid received a Gatorade shower from his team. Reid went on to lead the Chiefs to a 9-0 record at the start of the season, tied for the best start in franchise history. The Chiefs finished with an 11-5 record, clinching a Wild Card spot in the AFC playoffs. In the Wild Card round, they were defeated by the Indianapolis Colts 45–44. Under Reid, the Chiefs would again obtain a winning record in 2014, finishing 9-7. However, they failed to qualify for the playoffs. In 2015, the Chiefs were in danger of missing the playoffs for a second consecutive year after they lost five straight games and began the season 1-5. Reid accepted the blame for his team's poor start and his future with the Chiefs was called into question. However, the Chiefs rebounded and proceeded to win every remaining regular season game, finishing with an 11-5 record and a Wild Card spot in the AFC playoffs. Reid would go on to lead the Chiefs to their first playoff win since 1994 in a 30-0 shutout of the Houston Texans, but the team would be defeated 27-20 in their subsequent divisional round game against the New England Patriots. Prior to the loss, the Chiefs posted an eleven-game winning streak, which is the best in franchise history. Reid was criticized for his clock management near the end of game, calling no timeouts in a late fourth quarter drive that cut the Patriots' 27-13 lead down to a touchdown, but took the Chiefs 5 minutes and 16 seconds to score and left them with only a minute and 13 seconds on the clock to tie the game. 11 5 0 .688 2nd in AFC West 1 1 .500 Lost to New England Patriots in AFC Divisional Round. ↑ "Andy Reid's full bio" (PDF). The Official Website of the Kansas City Chiefs. Retrieved December 11, 2014. ↑ "Lurie has already told Reid he's fired". NBC Sports. Retrieved 31 December 2012. 1 2 Rosenthal, Gregg (January 4, 2013). "Andy Reid, Kansas City Chiefs reach agreement". National Football League. Retrieved January 4, 2013. 1 2 "Reid agrees to become Chiefs coach". MSN.com. FoxSports.com. Retrieved January 4, 2013. ↑ "Andy Reid BYU profile". BYUCougars.com. ↑ Scurfield, Nick (November 30, 2010). "Eagles' Reid muses on former pupil Pollack". houstontexans.com. Retrieved January 10, 2011. ↑ "Kelly Received Guidance From Reid". Philadelphia Eagles. NFL Enterprises LLC. January 17, 2013. ↑ Skretta, Dave (October 21, 2015). "Chiefs' Andy Reid taking blame for 1-5 start to season". Associated Press. ↑ "Andy Reid, John Dorsey under pressure with Chiefs' 1-4 start". National Football League. Retrieved 2016-01-03. ↑ "Clock management again bites Chiefs coach Andy Reid". ESPN. Retrieved 2016-01-18.